With a second colony of Barred Tooth-striped recently discovered in a nearby village I was keen to see if it also occurs in VC 37. So on Tuesday evening a pheromone trap was placed on Gadbury Bank where there is ample Privet growing on southeast slope. Four light traps and another pheromone trape were placed on the wide verge along the lane either side of Glebe Barn. 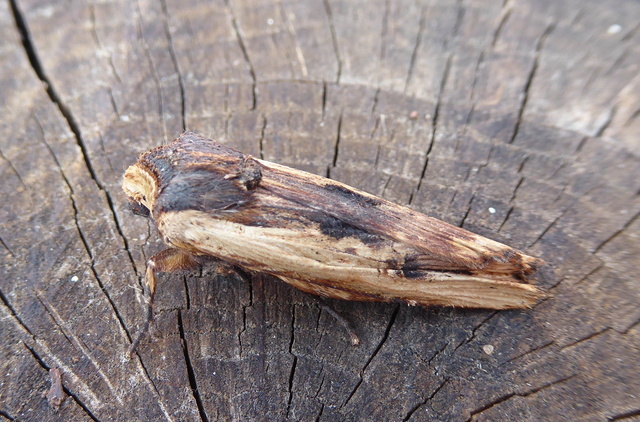 The first trap round saw a Red Sword-grass already settled on the sheet by my old 80w funnel trap. 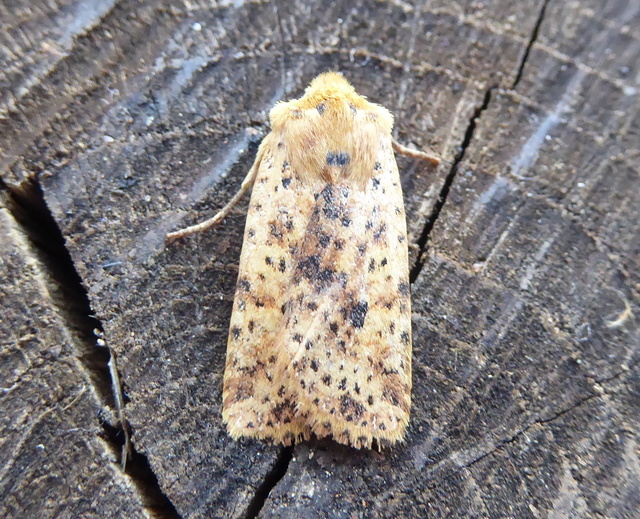 A good start as less than 20 records in Worcs ever! On the second round, another even better Worcs moth a Small Eggar on an egg box in the same trap! A Grey Shoulder-knot was found hanging on a hawthorn twig near an actinic and inside that trap was a Dotted Chestnut. Agonopterix alstromeriana, 3 Dark Chestnuts, 6 Shoulder Stripes, a Water Carpet and an Early Thorn were the best of the rest but alas no BT-s were seen. An extra time visit to the Bromsberrow garden (Glos) secured views of a Barred Tooth-striped caught there that same evening. 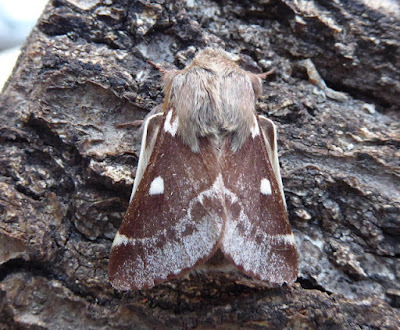 BTW Rob Hemming and I trapped in Dymock Forest last night in the spot where Barred Tooth-striped was recorded last and apart from hypothermia, my list came to 13 species and no sign of the target moth and very little sign of foodplant either for that metter. I even did the Paul Waring advise and did torchlight searches of the privet. Yes, seeing this moth away from these passively managed garden habitats seems very difficult. I believe Dave Grundy gave it a few shots both near Staunton and further afield with no success. Perhaps I should just find a single garden somewhere in VC 37 and politely knock on the door!